There must be something to eat around here. If I can only get around Mom’s big hoof. 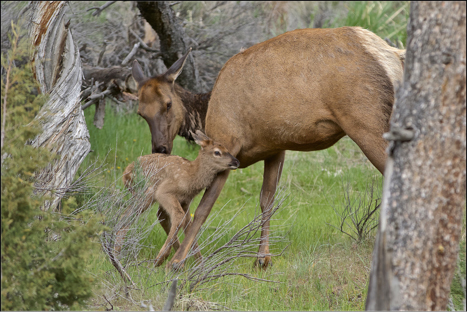 This is the first time in 12 spring visits to Yellowstone that I have been lucky enough to photograph a newborn Elk calf. The hour old youngster did eventually find its first meal. This first meal helps to establish the very important bond between Mom and calf. Mom will finish cleaning the calf and, after just a couple more feedings, she will lead the calf away from the birth site to protect them both from the predators attracted to the birthing smells. She will take the calf as far as he/she can walk. The calf will then lay down by a large rock or sage bush and put its chin flat on the ground. This is the smallest profile the calf can present so predators cannot make visual contact. Mom will walk away and observe from 15 to 20 yards, returning about every 4 hours for feeding time.